June 20, 2014 — “Ya’ll ready for the new world order?” The question was asked us by an elderly man who had just dropped out of his pickup truck with his wife. We were standing in front of a series of large granite slabs that were the only things around for miles. The twang the man spoke with was all Georgia, the state in which we found ourselves, outside the city of Elberton. The old-timer explained he’d lived in Georgia all his life, but had only recently moved close enough to visit this oddity he’d heard about for decades. “We’re from New Hampshire,” I told him. 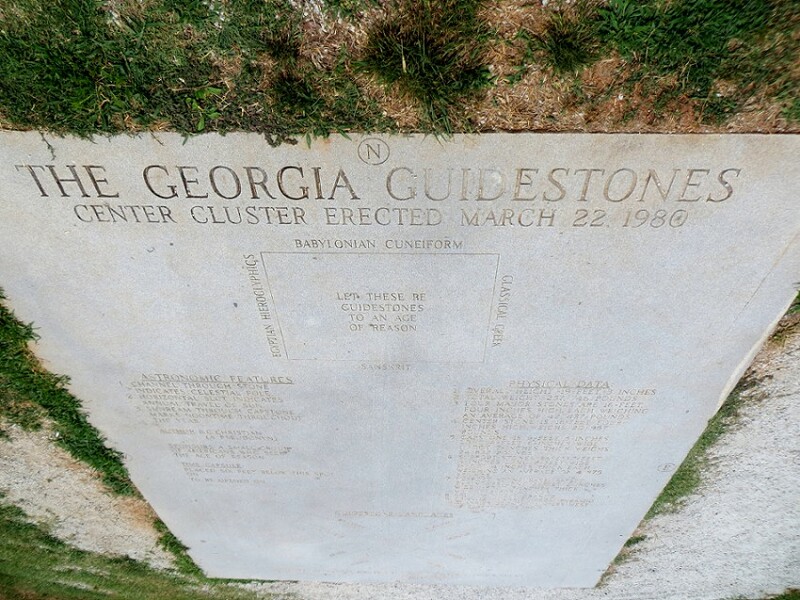 The Georgia Guidestones are certainly one of the more famous oddities in the country. The thing is, they’re not exactly interesting by themselves. They’re a bunch of quarry stones placed on the edge of some farmland. 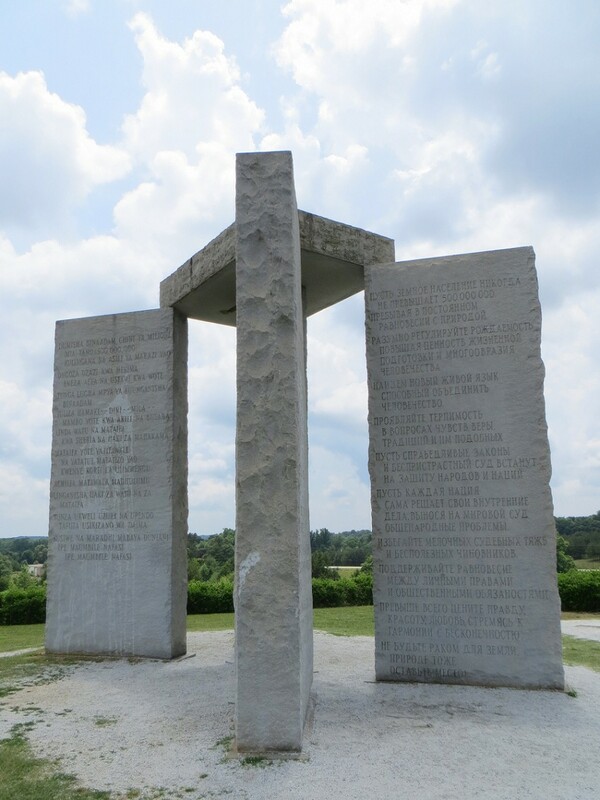 Specifically, there are four 19-foot-tall rectangular slabs set on end that form an X-shape with a thinner center slab of the same height, all of which is capped by another slab of granite. From certain angles they look like open doors and, given the empty farmland around them, stand out like a message from the Almighty, but overall the arrangement seems the type of inoffensive art you might find on the property of a corporation or in an outdoor sculpture park. Except for what they say. 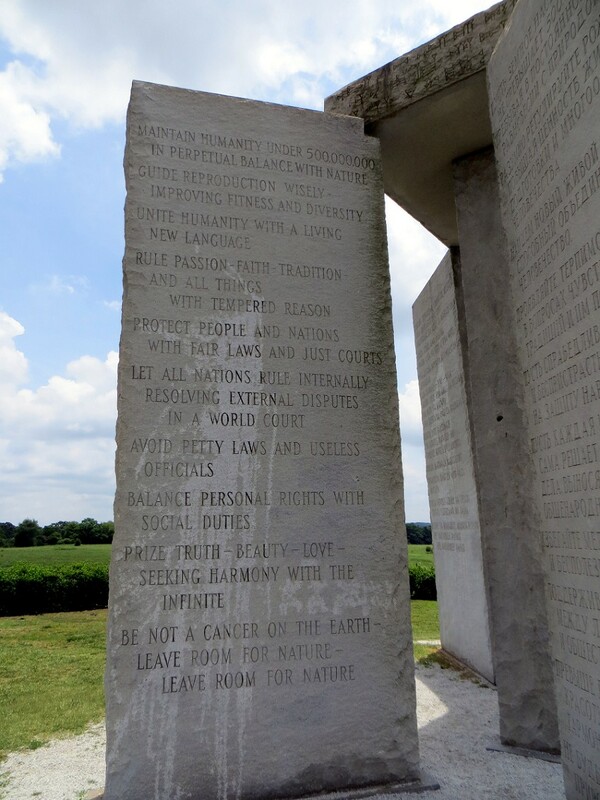 Inscribed on the surface of the slabs is a series of 10 vague, preachy ideas for bringing about utopia. You know, limit the population, unify the language, be excellent to each other, party on—the kind of thing a crazy bum might scrawl on a cheeseburger wrapper and hand you or which you might find in a brochure shoved inside your screen door from the local cult. The guidelines are carved into the stone in eight different languages; English, Spanish, Swahili, Hindi, Hebrew, Arabic, Chinese, and Russian. On the four sides of the capstone is the phrase, “Let These Be Guidestones to an Age of Reason” in Babylonian cuneiform, ancient Greek, Sanskrit, and Egyptian hieroglyphics. And while this strange multilingual message to mankind makes them a little more interesting, what really elevates the oddity is the same thing that makes anything interesting…the mystery of them. We don’t know who erected them. And I don’t mean like we don’t know so it might be aliens or a lost civilization. I mean, the group who funded this monument remains anonymous after more than three decades, even as the fame of the oddity has spread. In 1979, a man walked into a local granite company, gave his name as R. C. Christian, and threw some money down. “Make me a monument,” he said in what I assume was a Georgia drawl similar to my new friend. From there the story is sparse. 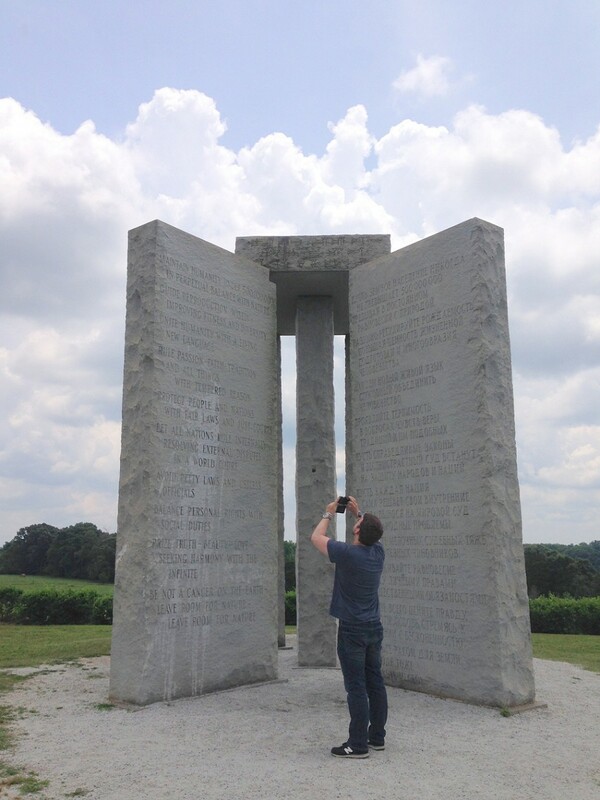 Christian, whose name was a pseudonym, said that he represented a group of religious, patriotic people who really wanted a giant geometry of stones to exist. And that’s all he needed to say since he had the money. But that’s it. That’s the story that makes these plain planes of stone stand out. After all, anybody with a chisel can carve esoteric pronouncements in stone. It takes someone truly remarkable to shut up and go away. 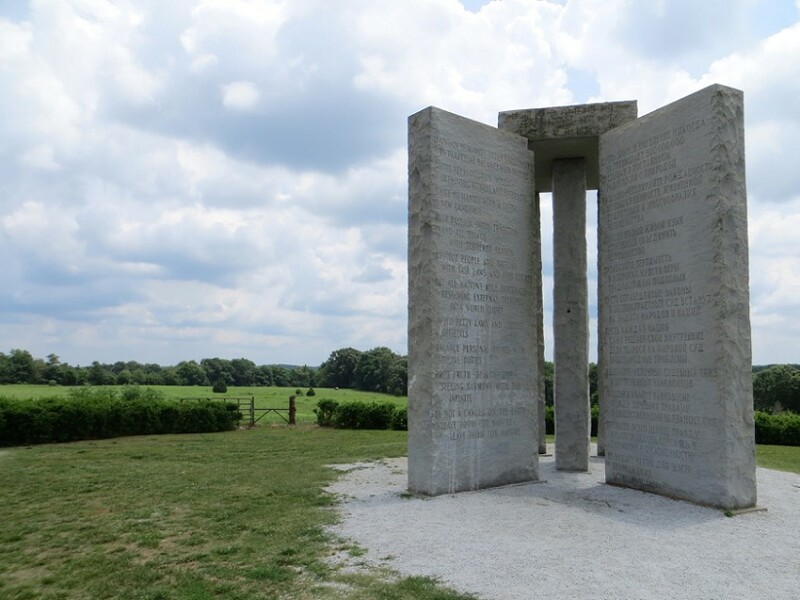 Today, the Guidestones show up on the home page of Elberton’s website and an informational plaque is installed beside them like any historical monument or tourist destination. It even has its own little parking lot. Most of the information we have about the stones is engraven into a nearby keystone. This slab of rock is embedded horizontally into the ground beside the Guidestones. 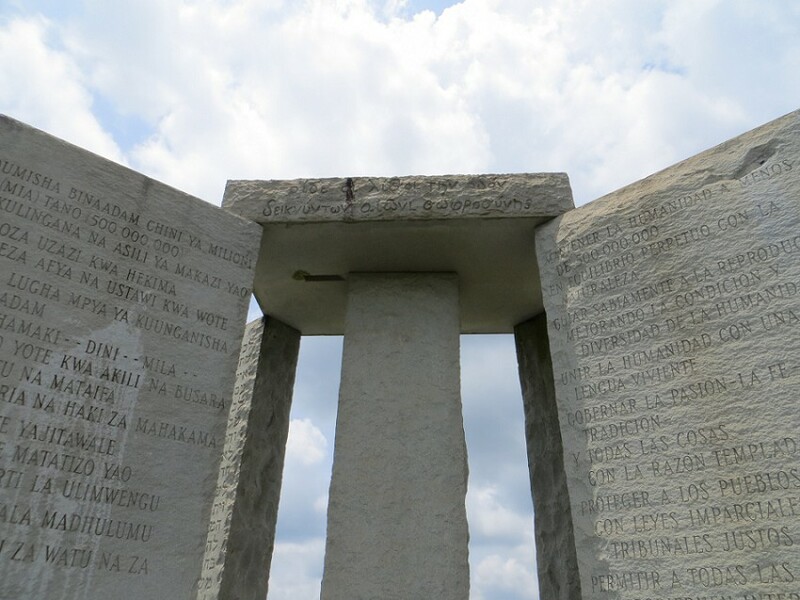 On it are listed the physical dimensions of the slabs, the languages inscribed, and—since it follows the time-honored tradition of setting up giant stones to align with the solar calendar—astronomical properties. Basically, all the what, none of the way. The most interesting part of the keystone is that it claims to be sitting atop a time capsule, but, since the dates for the capsule were left blank, it’s thought that the capsule may never have been buried. We hung out at the Guidestones for maybe 40 minutes, and in that time, quite a few people showed up to wilt in the June Georgia sun and gawk at the rocks. Besides the elderly couple, there was another couple on a motorcycle, a pair of ladies in a convertible, a solitary man driving a minivan, and a family of eight…all pilgrims looking for the secret to the ultimate society.